Japanese Episode DP 034: "Buoysel! The Road to Being the Strongest!!" 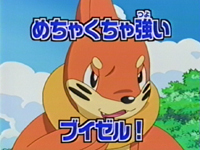 American Episode 498: "Buizel Your Way Out Of This!" While on the way to the Hakutai Gym, Satoshi and his friends hear about a powerful Buoysel near a fishing spot. Wanting a match with the pokemon, Satoshi-tachi go to the area and put their fishing rods in the water, hoping to lure it out. Before long, the water-type pokemon appears and begins to battle our heroes. Hikari fights the pokemon first, but her Potchama is quickly defeated. Next up is Hikari's rival Nozomi, who had gone to the area to catch a strong water-type pokemon. Nozomi's Nyaruma puts up a good fight, but it too is defeated by Buoysel. Satoshi's Pikachu fights next, but it isn't able to land any electrical attacks and is defeated before long. Bored with the lack of worthy opponents, Buoysel runs off. Satoshi follows the pokemon to a waterfall and watch as it gets in some post-battle training. Our heroes decide to train too, so Satoshi 's Pikachu and Hikari's Potchama do their best to imitate Buoysel. The training is brought to an abrupt end, however, when the Rocket-Dan appear and attempt to kidnap the wild pokemon! Satoshi-tachi save it without too much trouble, earning Buoysel's respect and another chance to battle it. Hikari's Potchama volunteers to prove its worth as a water-type pokemon, so the rematch begins. Buoysel starts off very strong, but when Hikari is told to battle Buoysel as if she was in a Contest, the battle starts turning in Hikari's favor. The young Coordinator is eventually able to weaken Buoysel enough to capture it in a Monster Ball, giving her one more traveling companion! Now that the strong Buoysel has been taken care of, our heroes decide to return on the road to Hakutai City. Oh my God this is a boring episode. I remember nearly falling asleep when watching the Japanese version of this episode, so when I went to watch it again for this comparison, I was prepared with a caffeinated drink. But even that didn't keep the drowsiness away. I don't know what it is about this episode, but it just could not hold my interest. I mean, it does have some redeeming qualities. Sakaki's press conference (with the big "R" flag and a seat just for his guitar) amused me, and the throwback to Kasumi's lure was nice as well. But the majority of the episode is just one boring battle after another. Whoop-de-freakin'-do. The dubbed version is special because there's a long scene at the beginning without any music. But I'll talk more about that later. Other than that, Zoey's voice acting (and I'm using the term loosely) is just atrocious. Her introduction, for example: "Just as noisy as ever, I see. [awkward pause] That's better. [awkward pause] It's me!" What baffles me is that the director of the episode decided that the performance was good enough and decided to run with it. Ugh. Buoysel keeps its Japanese voice. Not unexpected after the Manaphy movie and all. So the big note to make about this episode is that PUSA actually left in some silence! "Fear Factor Phony" had those few seconds without any music, but ever since then, the dub has been wall-to-wall music. I've never understood why made-for-TV dubs have to have music playing nonstop since their American peers don't, but surprisingly, PUSA breaks that "rule" in this episode. After the opening theme, English viewers are treated to a full fifty seconds without any background music. No 4Kids filler stuff, no PUSA filler stuff, nothing; just the sound effects and the voice actors working together, doing their thing. But you know what's ironic? The scene wasn't completely silent in the Japanese version! While the original version of the episode does indeed start out without any background music, a dramatic piece starts playing as soon as the Zigzaguma trainer appears on-screen. Yet PUSA removes this, turning the 20 seconds without music into 50 seconds without music. So instead of putting music in during a moment of silence like they've been doing since the beginning, Pokémon USA actually does the exact opposite. Never thought you'd see the day, huh? In the Japanese version, Nyasu imagines Sakaki going on a world tour on his yacht and getting lost at sea. In the dub, the "world tour" part is pretty much ignored. From the moment Nozomi tells Hikari to treat the final battle of the episode like a Contest battle until the moment Hikari catches Buoysel, Pokemon Symphonic Medley plays in the background. The dub this is, of course, replaces this.